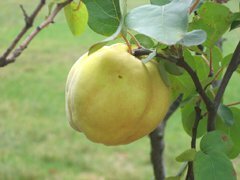 Fragrant, delicious quince fruit is a member of the Rosaceae family of pome fruits. Native to Asia Minor, this once popular delicacy has taken the backseat in the modern times of the molecular biotechnology world. 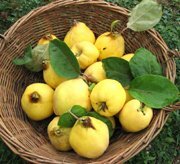 Quince is rarely eaten raw but employed in cooking where just a small section of it would impart the whole recipe with a pleasant fruity aroma. Quince fruit seeds are poisonous and should not be eaten. Raw fruit may cause irritation in the throat and may cause breathing difficulty. (Medical Disclaimer). <<-Back to Fruits from Quince fruit. Visit here for an impressive list of all variety of fruits with complete illustrations of their nutrition facts and health benefits.